Recently I was contacted by Bryce Thomas of IncubatorWarehouse.com. Not only were they willing to have me review some of their equipment used in hatching chicks but he also wrote a wonderful guest post for me. For the next couple of weeks I am not going to be posting as regularly as I have to make several trips out of state to prepare for my mother’s service. This seems like the perfect time to share his post on “How to Insulate a Chicken Coop”. With all the cold weather we are having this information is rather important to help keep our chickens warm and healthy! 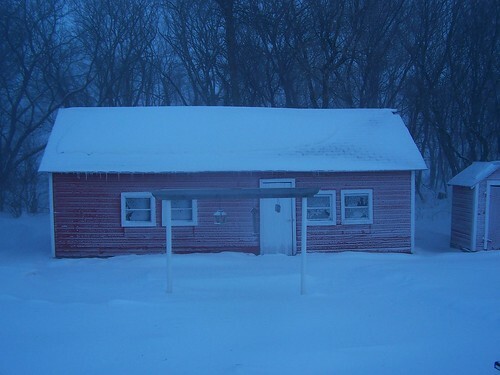 Our coop in the winter. If you have chickens and you live in colder climates, you’ve probably asked yourself if your coop needs to be insulated. While chickens can typically survive the cold winter months without insulated coops, keeping the temperature a bit higher will make the chickens happier. If the chickens do not have the stress of harsh winters, then they may lay better in the spring and summer months. Chickens can survive in dry air down to 0 Fahrenheit without too much of a problem. However, if the air becomes too moist or humid, frostbite can affect their combs and feet. Insulating coops can reduce moisture buildup and high humidity that can come from condensation forming on the inside of the coop. It also helps reduce the drafts inside, which are harder on the birds than the cold. Insulated coops also allow you to sleep better at night when a storm comes rolling in and you are wondering if the temperatures will fall lower than anticipated. Chickens in a dry, draft-free coop can withstand the cold very well. However, there are some downsides to insulation. Insulation on the inside the coop can be problematic. Batt, blown in, or other loose insulation is prone to rodents. Solid, styrofoam insulation deters rodents from making a home, but, for some reason, chickens seem to go to great lengths to eat it. Regardless of the insulation used, a solid inner wall is a must. 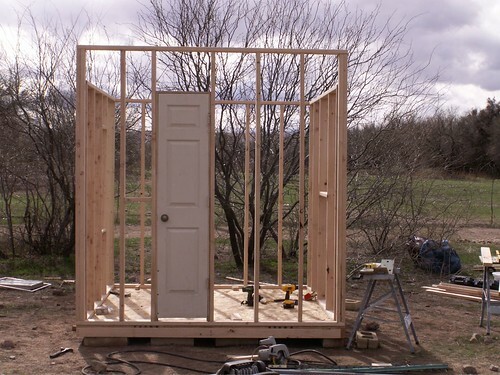 If the coop is stick framed or has wall cavities, and you have access to those wall cavities, you could insert batting or other loose commercial insulation. If cost is an issue, loose straw, sawdust, shredded old fabric or blankets, newspapers, or just about anything will work. This is only really feasible if you can easily access these voids in the wall. Remember, the inner wall of the coop needs to be very tight and solid. Not only will it keep the chickens from eating your insulation materials, it will deter rodents and other creepies from making their homes there. While some insects inside the coop are fine, and even nutritious for the chickens, others can become too much of a nuisance. You don’t want a nest of hornets, yellow jackets, or venomous spiders in your coop. If there are no voids or cavities in the walls, or they are inaccessible, you can apply insulation to the outside of the coop. 2-inch thick styrofoam panels work well for this. The styrofoam can be cut to size and shape, along with a new outer plywood wall, and both pieces screwed into place. Offsetting any joints in the materials will significantly reduce drafts inside the coop. Several layers of cardboard will also work in place of commercial styrofoam insulation. Remember the coop’s floor and ceiling also need insulation. Since chickens typically can’t peck the ceiling of their coop, this inner wall is not as crucial. Stapling up some rolled insulation will probably suffice. If it is a raised coop, you may be able to attach the insulation under the floor. If not, several inches of good saw shavings or straw will work well on the floor. We keep a nice thick layer of shavings in our coop. Be sure to check the type of wood the shavings comes from. Some shavings may contain dried glues, chemicals, or other toxins, plus cedar and some other woods are poisonous to chickens. Saw dust that is too fine may cause respiratory issues, so be sure to use are larger shavings. Ensure that if straw is used, it stays dry. The coop will need to be cleaned often, or at least raked out to let any damp spot dry out, preventing the growth of mold and mildew. Help your coop to be comfortable for your chickens because somedays they won’t want to go outside! Good information! We are new to Maine and couldn’t understand why the coop on the property we purchased wasn’t insulated. Having come from CA we didnt have an insulated coop but here it will feel better for the new little family of chicks we bought to have a warmer coop once they are out of the brooder & into the coop. We are insulating this weekend! ???? It is quite different here compared to CA but considering the good and not so good on both coasts we are loving it here. ???? Um, Nancy, I goofed. I subscribed to your blog but then somehow un-subscribed….I think. Is there any way to see if I am subscribed & if not, subscribe me? Thanks! We spent the first three years of our married life living in Maine and just loved it. I’m currently in Vermont which I enjoy but miss the salt water! Thanks for subscribing! Thanks for the thoughts. I am in Maine too, and have 11 RI Red chicks and starting to think about winter. I know they are a cold hardy breed, but it gets down to minus 10 and minus 20 where I live. I am still only in the thinking stage right now, considering everything from plastic tarp, cut-to-fit Tyvex/Typar pieces or just simple hay bale construction, whichever is cheapest and can keep drafts out. Also, snow sliding off the house roof and snowplowed mountains should be adding great insulation value. Chickens are pretty hardy, just keep an eye out for any signs of frostbite. We kept chickens for years in a drafty, uninsulated barn and they did fine! Great information. We’ve already had a very cold and harsh winter here in central OH and I’ll be spending some time this spring re-insulating parts of my coop. I’ll bet your chickens are looking forward to spring! It’s been a cold winter here in Vermont as well! I was curious if an insulated coop would make it too hot in the summer? We’ve never had any problem with our chicken coop being too hot in the summer, I think the insulation works both ways, it helps keep the coop warm in the winter and cool in the summer. We also have three windows we can open to keep air flowing through the coop. When this post was written we lived in Vermont which I’m pretty sure is just as cold as Idaho! For our first year we kept our chickens in an old drafty barn with a heat lamp, they did fine. When we built our house my husband built a chicken palace that was insulated and had two windows. We also used a heat lamp. If you use deep bedding, where you just keep adding shavings or straw and only clean the coop out maybe once or twice during the winter they will be fine. When the weather gets really cold just keep an eye on the chickens if you see their combs getting frostbite you know they are too cold! Have fun chickens are so entertaining plus you can’t beat the fresh eggs! My son-in-law made a very nice chicken palace for my 12 girls and they seem to love it. He put in venting all the way across the length of the coop at the roof lines, both sides, which is helpful in the summer for air but come winter won’t that be a little too much. It’s a raised coop so I will tarp the underneath and it isn’t insulated so wondered if I use the Styrofoam method can I attach it to the outside with another T110 board over that? You could try adding the board styrofoam to the outside. When we first got chickens they lived in a very drafty barn, no insulation at all. They are survived just fine. As long as they are dry and have deep bedding and the coop is not drafty they should do fine. I live in northern Saskatchewan, Canada. I have just acquired chickens which includes a large rooster and 4 bantam roosters. My coop is very old and am considering using sheep wool and cardboard to line the inside for insulation. Does anyone have any thoughts or experience in this type of insulating? I am going to get rid of roosters except one banty.